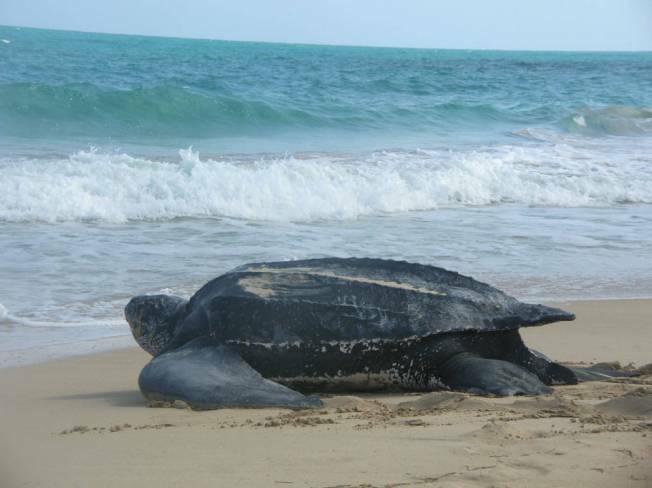 Volunteers have rescued a massive leatherback turtle off a Massachusetts beach. The Cape Cod Times reports that the turtle was spotted on First Encounter Beach in Eastham at around 3:30 p.m. Sunday. Mass Audubon Wellfleet Bay Wildlife Sanctuary Director Robert Prescott says the juvenile turtle weighed between 400 and 500 pounds, and it took six volunteers to take it off the beach. Prescott says leatherbacks are the largest of all sea turtles, and can weigh up to 2,000 pounds. He says the rescued turtle looked to be in great shape. Prescott says the turtle has been transported to the New England Aquarium where it will be examined.